In a large stock on high heat pot bring pasta water to boil, cover pot with lid to bring to boil quickly. Salt boiling pasta water with about 1 teaspoon of salt. Add pasta, stir and cook pasta for about 9 minutes or until al dente. Chop onion and garlic and set aside. Dice bacon into 1 inch slices and set aside. Slice andouille on the diagonal about 1 inch slices and set aside. In a large skillet heat 1 tablespoon of extra virgin olive oil on medium heat, add bacon and andouille, cook until crisp about 15 minutes. Remove bacon and andouille and drain on paper napkin. Pour all but 2 tablespoons of bacon grease from pan. Add two tablespoons of butter and saute onion over medium heat for about 4 minutes, add garlic and saute 1 minute.Add 1 teaspoon of spice mixture to the vegetables. Add 1 tablespoon of flour to mixture and whisk well creating a light roux. Whisk in half and half and milk and add cheeses, whisk well. Reduce heat to low and add an additional teaspoon of spice mixture to cheese sauce. Remove pasta and drain reserving 1 cup of pasta cooking water. Rinse pasta in hot water and drain. To the cream sauce add 3/4 c. of pasta cooking water and whisk well. 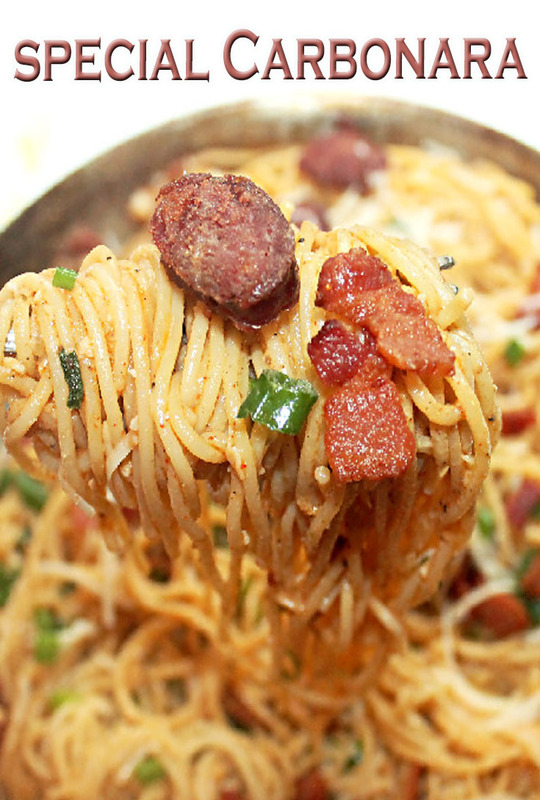 Add andouille and bacon to cream sauce and mix well. Add pasta to cream sauce and toss well. Cook over medium heat for about 1 minute. Taste pasta and add 1 more teaspoon of spice blend if desired. Garnish with green onions and extra Parmesan cheese and serve immediately.